Research in the Du group is at the interface of chemistry and biology. Specifically, we are studying the molecular mechanisms by which organisms (bacteria, fungi and plants) make structurally complex, biologically active natural products. Our goal is to use this knowledge to produce new products through genetic engineering that will be beneficial to humans. The studies involve tools and knowledge from biochemistry, molecular biology, genetics, and chemistry. Currently, we are working on three main projects. Polyketides are probably the most significant group of natural products in terms of their importance to human medicines. To date, most of the studies have focused on polyketides isolated from bacteria. Although fungi produce numerous polyketides, their biosynthetic mechanism is still not very clear. We have chosen a group of polyketides, including mycotoxin fumonisins, as a model system for our studies. Fumonisins are produced by the pathogenic fungus Fusarium verticillioides, which is a widespread contaminant of corn and maize-derived food and feed (Biopolymers 2010). The ingestion of fumonisin-contaminated corn causes fatal diseases in livestock and imposes cancer risk to humans. We have developed a genetic system that can specifically change the biosynthetic genes in filamentous fungi. Using this system, we have created mutants for the biosynthetic genes, determined biosynthetic intermediates in the mutants, and established a biosynthetic pathway. Through engineering the polyketide synthase gene, we successfully turned the mycotoxin-producing fungus into an antifungal metabolite-producer (JACS 2007). In addition, we have been using E. coli and baker's yeast as heterologous hosts to express and study the fungal genes (Biochem 2006). Our studies revealed an unprecedented PLP-dependent polyketide chain-releasing mechanism, in which a discrete 2-oxoamine synthase catalyzes a decarboxylative condensation between L-alanine and acyl-S-ACP (JACS 2009). The reaction results in the termination and offloading of the polyketide chain, as well as the introduction of a new carbon-carbon bond and an amino group to the chain. The mechanism is fundamentally different from the thioesterase/cyclase-catalyzed polyketide chain-releasing mechanism found in bacterial and other fungal polyketide biosyntheses (NPR 2010). Lysobacter is a genus of Gram-negative bacteria that are ubiquitous in soil and aquatic environments. Several Lysobacter species are prolific producers of bioactive natural products and emerging as new biocontrol agents (NPR 2012). From the biocontrol agent Lysobacter enzymogenes, we have isolated a potent antifungal compound HSAF, which appears to have a novel mode of action (MBC 2006; RSC Adv 2016; BBA 2016) and possesses new structural features distinct from any existing fungicides and antifungal drugs (AAC 2007). We have identified the genes for HSAF biosynthesis and investigated the biosynthetic mechanism (JACS 2011; Biochem 2012; Angew Chem 2014; AMB 2016). These studies revealed a previously unrecognized biosynthetic mechanism for hybrid polyketide-peptide. In addition, we isolated a group of potent anti-MRSA cyclic lipodepsipeptides WAP-8294A and identified the WAP biosynthetic gene cluster from the bacterium (AAC 2011; RSC Adv 2015). These works establish the foundation for exploitation of Lysobacter species for new antibiotics (ACS Synth Biol 2013).More recently, we have looked into regulatory mechanisms for the biosynthesis (AMB 2015) and revealed a flavin-dependent aromatic N-oxide formation in phenazine antibiotics (Org Lett 2016) . Plant endophytic microorganisms represent a largely unexploited resource for new bioactive natural products. It is estimated that each of the ~300,000 plant species on the earth has at least one endophyte. 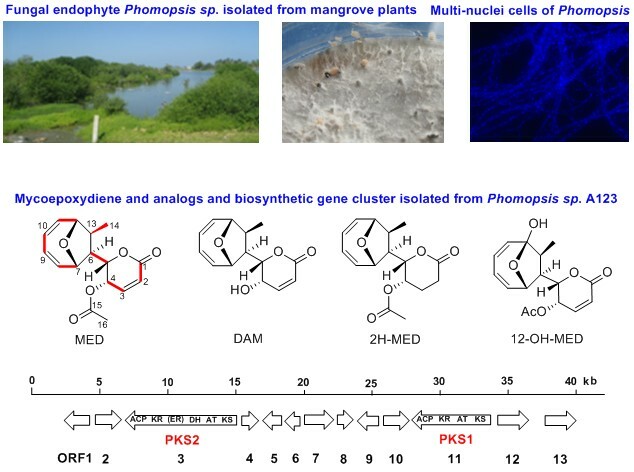 Collaborating with Prof. Yuemao Shen at the School of Life Science, Shandong University, we have isolated a family of structurally distinct and biologically active natural products from a new marine fungal strain, Phomopsis sp A123, which is an endophyte of the costal mangrove plants. These compounds, including mycoepoxydiene (MED) and deacetylmycoepoxydiene (DAM), exhibit a variety of biological properties including anticancer, anti-inflammatory and antimicrobial activities (AMB 2016) . Most interestingly, the compounds possess a rare structural feature, a cyclooctadiene with an oxygen bridge. To investigate the molecular mechanism for the biosynthesis of these compounds, we have cloned the biosynthetic genes from the endophytic fungus and used RNAi to verify the genes. For more information, please visit the Du Research Group Homepage. 19) Li Y, Wang H, Liu Y, Jiao Y, Li S, Shen Y, and Du L. 2018. 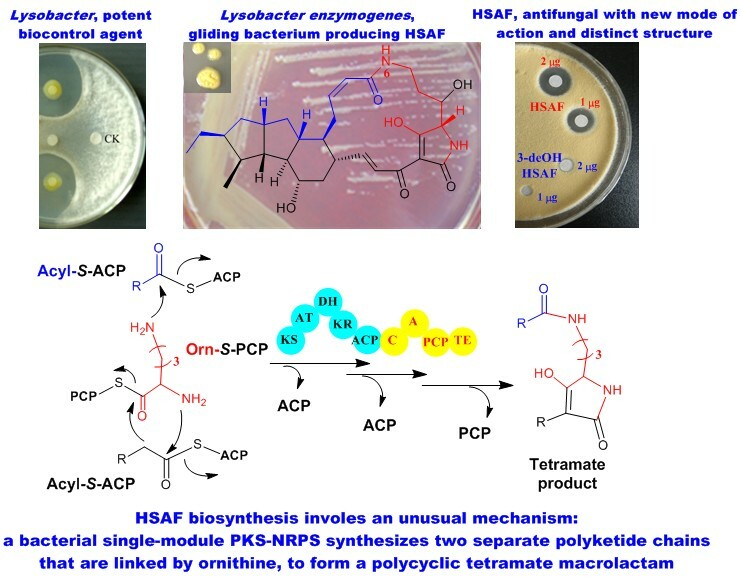 Biosynthesis of the polycyclic system in the antifungal HSAF and analogues from Lysobacter enzymogenes. Angewandte Chemie International Edition in press DOI: 10.1002/anie.201802488. 18) Jiang J, Guiza-Beltran D, Schacht A, Wright S, Zhang L, and Du L. 2018. Functional and structural analysis of phenazine O-methyltransferase LaPhzM from Lysobacter antibioticus OH13 and one-pot enzymatic synthesis of the antibiotic myxin. ACS Chemical Biology in press 10.1021/acschembio.8b00062. 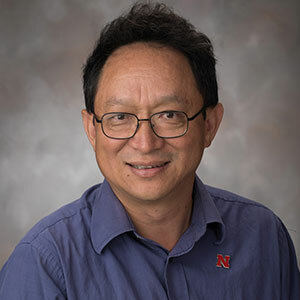 16) Li S, Wu X, L Zhang, Shen Y, and Du L. 2017. Activation of a cryptic gene cluster in Lysobacter enzymogenes revealed a module/domain portable mechanism of nonribosomal peptide synthetases in the biosynthesis of pyrrolopyrazines. Organic Letters 19: 5010−5013. pdf. 15) Han Y, Wang Y, Yu Y, Chen H, Shen Y, and Du L. 2017. Indole-induced reversion of intrinsic multi-antibiotic resistance in Lysobacter enzymogenes. Applied and Environmental Microbiology 83:e00995-17. pdf. 8) Lou L, Chen H, Cerny RL, Li Y, Shen Y, and Du L. 2012. Unusual activities of the thioesterase domain for the biosynthesis of the polycyclic tetramate macrolactam HSAF in Lysobacter enzymogenes C3. Biochemistry 51, 4-6. pdf. (Highlighted on Biochemistrywebsite, January, 2012). 7) Zhang W, Li Y, Qian G, Wang Y, Chen H, Li Y-Z, Liu F, Shen Y, and Du L. 2011. Identification and characterization of the anti-Methicillin-Resistant Staphylococcus aureus WAP-8294A2 biosynthetic gene cluster from Lysobacter enzymogenes OH11.Antimicrobial Agents and Chemotherapy 55: 5581-5589. pdf. 6) Lou L, Qian G, Xie Y, Hang J, Chen H, Zaleta-Rivera K, Li Y, Shen Y, Dussault PH, Liu F, and Du L. 2011. Biosynthesis of HSAF, a tetramic acid-containing macrolactam from Lysobacter enzymogenes. Journal of the American Chemical Society 133: 643-645. pdf. 5) Du L and Lou L. 2010. PKSs and NRPSs release mechanisms. Natural Product Reports 27: 255-278. pdf. 4) Gerber R, Lou L, and Du L. 2009. A PLP-dependent polyketide chain releasing mechanism in the biosynthesis of mycotoxin fumonisins in Fusarium verticillioides. Journal of the American Chemical Society 131: 3148-3149. pdf. (Highlighted on JACSwebsite, March, 2009). 3) Zhu X, Yu F, Li X-C, and Du L. 2007. Production of dihydroisocoumarins in Fusarium verticillioides by swapping the ketosynthase domain of the fungal iterative modular polyketide synthase Fum1p with that of lovastatin diketide synthase. Journal of the American Chemical Society 129: 36-37. pdf. 2) Yu F, Zaleta-Rivera K, Zhu X, Huffman J, Millet J, Harris SD, Yuen G, Li X, and Du L. 2007. Structure and biosynthesis of HSAF, a broad spectrum antimycotic with a novel mode of action. Antimicrobial Agents and Chemotherapy 51: 64-72. pdf. Cited by Faculty of 1000 Biology (Evaluated by D. Newman, NIH, March 8, 2007) pdf.